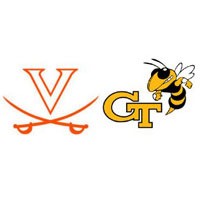 Georgia Tech closed to within five in the second half, but a 16-1 UVa. run pushed the Cavs to a 20-point lead, and they coasted from there to win 82-54 on Sunday. The win snaps a two-game losing streak for Virginia (19-8, 9-5 ACC), which climbed into a tie for third place in the Atlantic Coast Conference. Akil Mitchell led four ‘Hoos in double figures with 18 points on 8-of-9 shooting from the field. Jontel Evans had 10 points and eight assists for UVa., which has now won 15 in a row at the John Paul Jones Arena.